Who doesn’t love a Chocolate Chip cookie? and who doesn’t like options? 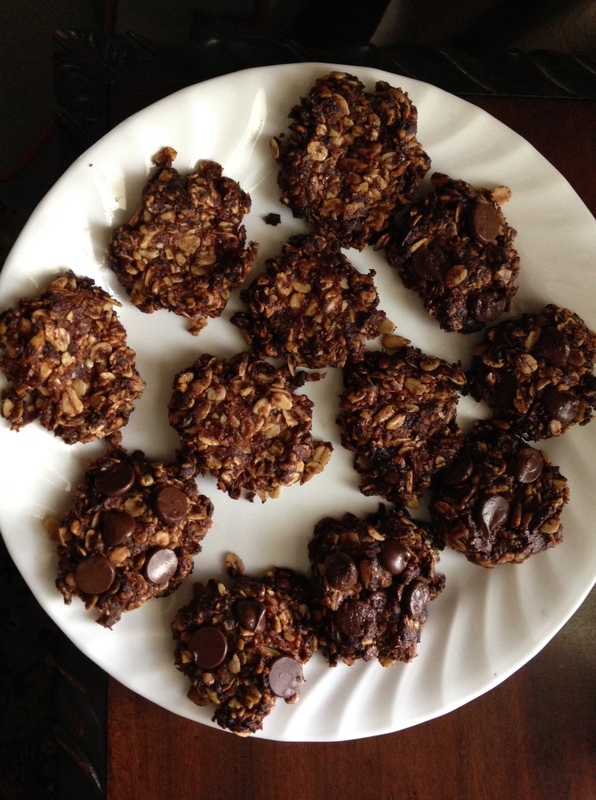 These “Cookies” can be baked or raw, cookies or bars, and can have dried fruit or chocolate chips, both or neither! In a food processor combine oats, seeds, dates, cinnamon and coconut oil until well-mixed. If desired, add chocolate chips, cranberries. You can stop there, make bite-sized balls or bars of yummy healthy treats! OR if you choose to bake these little ladies, consider glazing with equal parts maple syrup and olive oil, place on to a greased cookie sheet (I grease mine with coconut oil) and pop them in to a pre-heated oven, 375, middle rack, for 15-20 minutes. Your house will smell amazing after cooking these healthy treats. If you are going for the chocolate chip dessert option, I like to melt dark chocolate chips and drizzle over the cookies. Let cool in the freezer and enjoy! Wow! Do the dates hold them together that much? No syrup IN the dough–right? We’ve omitted oatmeal for quite a long time, and I’ve wanted to reintroduce it to see how we do with it. (It didn’t matter if they were gluten-free oats or not, a couple of us still had issues with them.) This looks like a great treat! I’ll be back if we try them. Yeah they can be a tad crumbly once they are cooked (I’ve sprinkled them over fruit or ice cream) so I tend to do the raw version —one less step and easier clean up that way too!